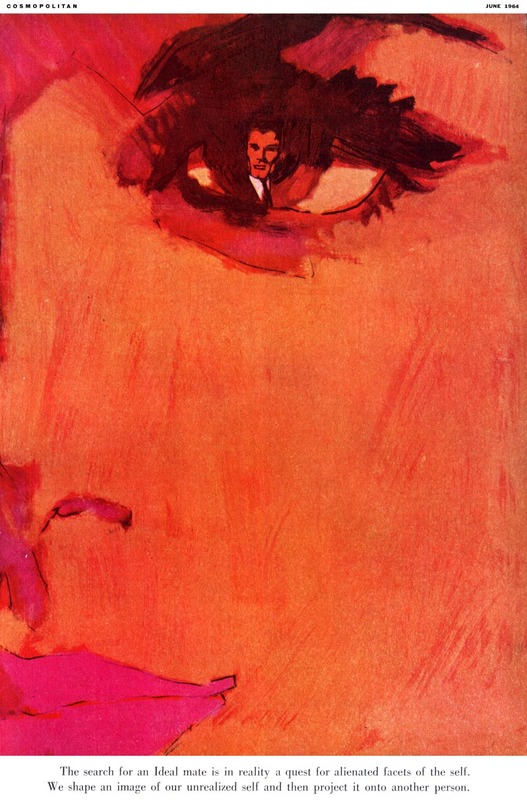 Today's Inspiration: Bob Peak: "The finest illustrators... work with ideas." 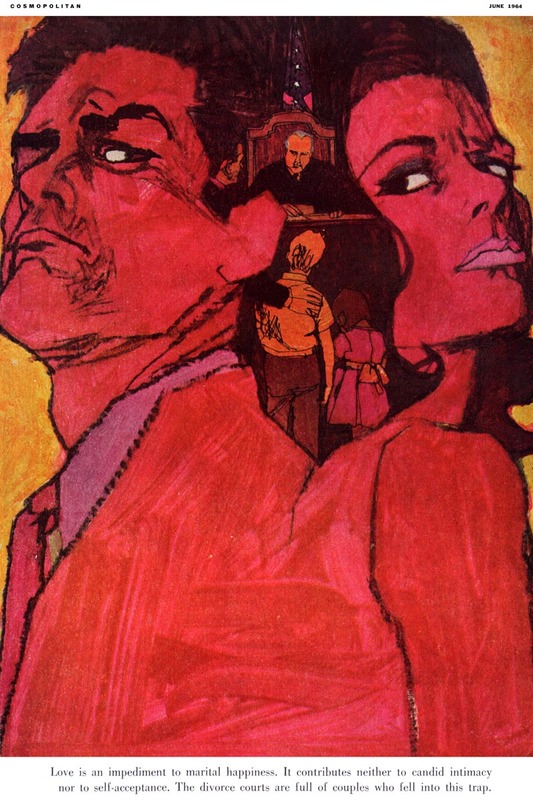 Bob Peak: "The finest illustrators... work with ideas." "Illustration is an interpretation of an idea." "This has nothing to do with technique - use of color, realism. These are mere tools." "It is not, as some people think, simply a matter of accurate rendering, although the artist has sometimes been reduced to a renderer. With the advent of photography, there was no longer a need for the artist to perform this function, and he shouldn't be expected to. The camera does a far better job." "The artist's reason for existence is the production of an idea. The finest illustrators working today all are people who work with ideas. If illustration is to do anything at all, it must be a part of the total creative problem." "So far as technique goes, the important thing is not to waste strokes. Draughtsmanship has always been easy for me, too easy in fact. At one point Albert Dorne told me, "You'll have to uncreate." "I knew what he meant and had to work it into my way of approaching a creative problem. Now, in every assignment, there is a great deal of preparatory thought. The actual execution of a painting takes about three hours. Few of the drawings take over one hour. Really though, this is a misleading statement. A painting may take ten years... "
"... that is to say, it was ten years before I could do it." 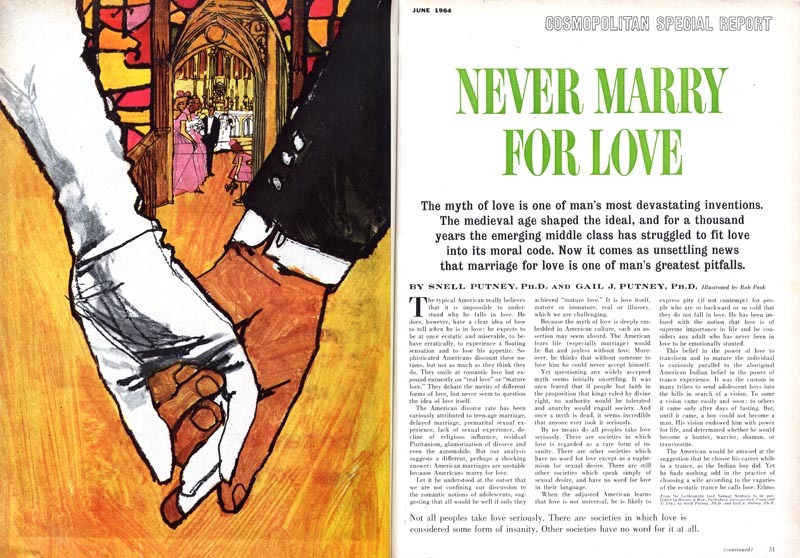 ~ From an interview with Bob Peak in the September 1962 issue of American Artist magazine. * My Bob Peak Flickr set. 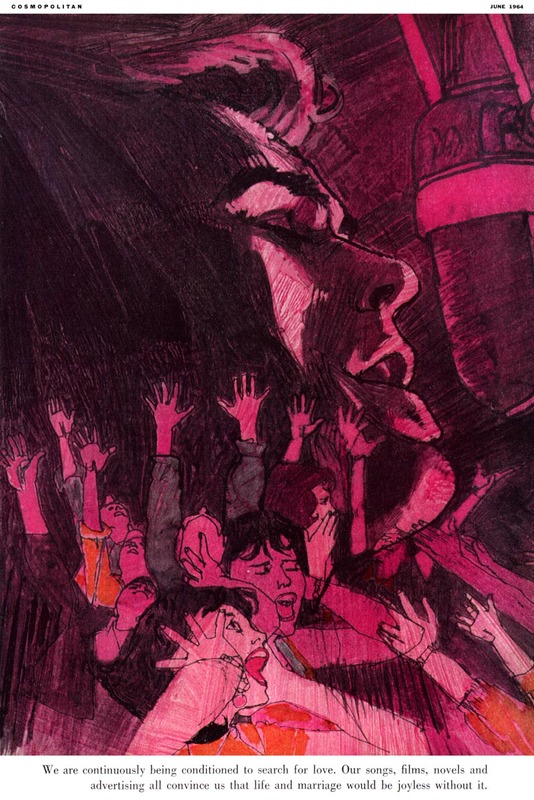 Bob Peak's quote: "With the advent of photography, there was no longer a need for the artist to perform this function, and he shouldn't be expected to. The camera does a far better job." This is where Peak and I disagree. There were plenty of illustrators that did accurate realistically rendered illustrations, and they were much more effective than most photography. If the camera does a better job, why have we always had realistic portrait painters? Because, it can be realistic and subjectively creative simultaneously. 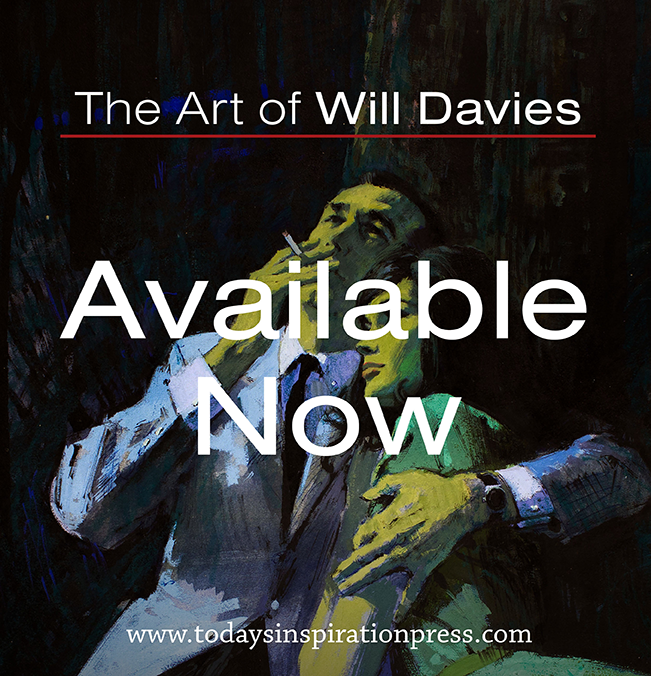 A good example is Charlie Allen's Chevron outdoor billboard illustrations, Robert Fawcett's Sherlock Holmes story illustrations or Burt Silerman's beautifully rendered paintings and illustrations, to name just a few.. and all were rendered with great insight and subjectivity. Maybe I am misunderstanding Peak in his statement, "the artist has sometimes been reduced to a renderer". That seems to me to be more about an illustrators technique, not his creative approach to the assignment. The concept is the cake, technique is merely the frosting, therefore the technique can be realistic, impressionistic, decorative or surrealistic, etc. The ingredients in the cake is or should be more important than the frosting. I really think Peak contradicts himself in his different statements. I tend to believe those statements were a reflection of the fierce competition between the photograph and the hand drawn or painted illustration during the 60s', and the notion was that if you render an illustration entirely different than a photograph, the art director would use the illustrator and not the photographer. Fast forward many decades, and what do we see in most of the ads today?? We all know that answer and why. Digital photography is cheaper. 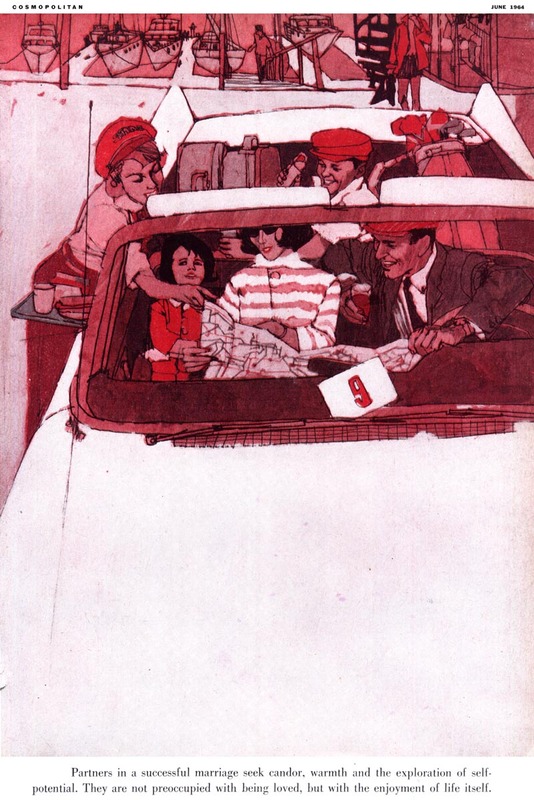 And, my last thought is that Bernie Fuchs stayed busy as an illustrator, after he changed his loose painterly avant-garde experimental techniques of the 60s' and into the 70s', to a far more realistic traditional technique after that. 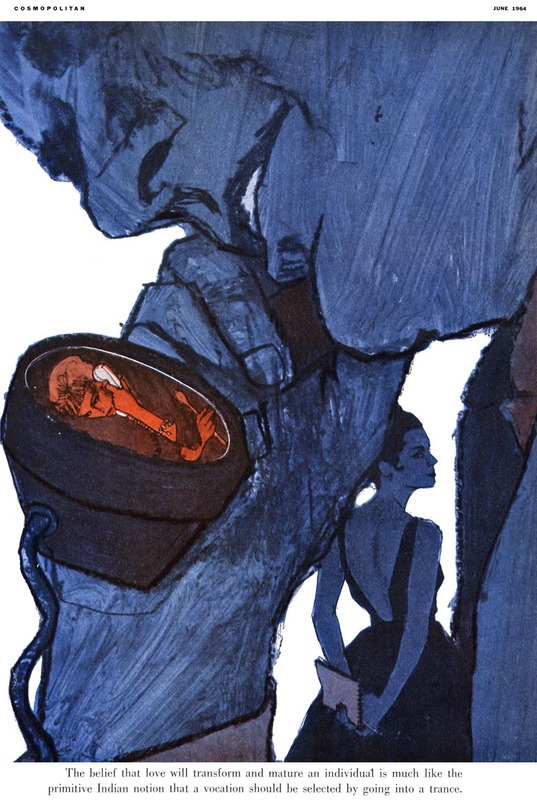 At the time, realistic rendering may have been a taboo for Bob Peak, but I saw plenty of very effective realistic editorial and advertising illustrations back then. Doesn't "uncreate" mean to be less creative or undo ones emphasis to create? Lots of interesting points, Tom - thanks for your thoughts. I think by "uncreate" Dorne was telling Peak to 'deconstruct' his more literal early style, not to be less creative. That's how I interpret it anyway. Leif, I agree with you completely on your comment about realistic illustration and the air brush Peak of later years. I have no problem with illustrators changing their minds, their rules and even their philosophy, because we all evolve and reinvent ourselves as we mature. He was pretty young when he was quoted in the interview, and the major focus on illustration was on making it look really different, especially for editorial illustration. Thanks to Tom and Leif for fine comments. Tom, on target, as usual. Both the examples of Peak's work on this weeks TI, and the strange statements from Peak, almost renouncing his earlier, more familiar ad illustrations and his 'hip', creative style....this is a side of Peak I just don't understand. And, as did Tom, I disagree with the statements and the thrust of them. For example, photos, when used in illustration, just don't cut it. One or two magazines tried it, and failed. My aunt, a college prof and not an artist, told me in my teens illustrations give the reader escapism, a chance to use one's imagination, interpreting the story and its characters....your own way. Photos are just hard facts. Still prefer the 'shallow' ad and commercial side of Bob Peak! Re: that Dorne quote about uncreating, I agree with Leif, and with Picasso who said, "In the old days, pictures went forward toward completion by stages.... A picture used to be the sum of additions. In my case, a picture is the sum of destructions." David and Leif, you are probably both right, but I hate ambiguous quotes, that leave me wondering and guessing. Since creativity was the hallmark of that period, I can't imagine Dorne telling anyone to be less creative.. unless he thought their creative attempts were miss directed, and sliding over the cliff of effective illustration. Dorne was a nuts and bolts detailed illustrator with little avant-garde experimentation, at least the stuff I have seen, so that adds more puzzlement for me in the word "uncreate". Anyway, it's all history now, subject to different interpretations I guess. it seems to me that Dorne was simply saying "do less".